According to our current understanding of insulin exocytosis, insulin granules dock on the plasma membrane, undergo priming and then wait for calcium-triggered fusion. 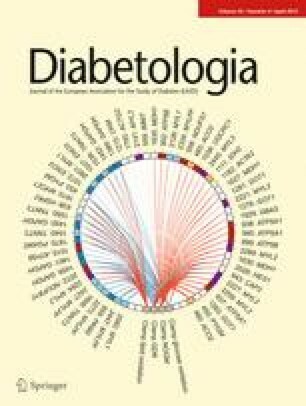 In this issue of Diabetologia, Hoppa et al (doi 10.1007/s00125-011-2400-5) report that cholinergic stimulation induces granule–granule, or multivesicular, fusion to effect more efficient insulin release. Other exocytotic modes of insulin secretion, particularly those induced by incretin stimulation, include orderly granule fusion with granules already fused with the plasma membrane, called sequential exocytosis, and recruitment of newcomer granules to fuse with plasma membrane with minimal time for docking and priming. The molecular machineries that mediate these distinct exocytotic modes of granule–granule fusion and newcomer granules remain undefined, but they could be therapeutically targeted to couple to cholinergic and incretin stimulation to rescue the deficient glucose-stimulated insulin secretion in diabetes. Insulin granule fusion with the plasma membrane, termed exocytosis, releases insulin into the circulation to maintain glucose homeostasis in health . In diabetes there are well-described defects in insulin exocytosis that prevent the beta cells from responding adequately to the increasing glycaemic demand . Stimulation of insulin secretion can be effected by increasing the number of individual insulin granules reaching (and fusing with) the plasma membrane. This process is called primary exocytosis, and this occurs in two modes (Fig. 1). The first mode involves insulin granule docking on the plasma membrane followed by priming (the biochemical preparation of the granule for release). The granule then sits on the plasma membrane for long periods awaiting glucose stimulation to cause its exocytotic fusion. This is believed to be the primary contributor to first-phase glucose-stimulated insulin secretion (GSIS) . In the second mode of primary exocytosis, insulin granules from the beta cell interior are mobilised to the plasma membrane and undergo fusion after only a short period of, or almost no, docking time, called newcomer granules [3, 4] (Fig. 1). The insulin granules involved in the latter mode of primary exocytosis are termed newcomer granules. These are responsible for the majority of second-phase GSIS and contribute to a substantial proportion of first-phase release [3, 4]. There is a third mode of insulin exocytosis, termed compound exocytosis (Fig. 1). This was first shown many years ago by electron microscopy but was largely ignored . More recent work employing two-photon microscopy of extracellular polar dye sulforhodamine B (SRB) have shown compound exocytosis to account for a near-negligible 2–3% of the exocytosis elicited by glucose stimulation . Two-photon microscopy is the method with the highest temporal and spatial resolution for the detection of the permeation of SRB into exocytosing granules as fusion pores open to the cell exterior. However, in the initial elegant studies , insulin granules were shown to fuse, with some delay, to granules that had already fused with the plasma membrane, hence this type of compound fusion was termed sequential granule fusion; and this involved only two, or sometimes three, granules . The incretin hormone glucagon-like peptide 1 (GLP-1), which is well known to greatly potentiate GSIS via cAMP and protein kinase A (PKA) pathways and is currently used clinically to treat diabetes, was shown to increase GSIS by increasing primary exocytosis and sequential exocytosis [7, 8]. Another mode of granule–granule fusion is multivesicular exocytosis (also known as true compound exocytosis), whereby granules undergo complete or partial fusion inside the cell (homotypic fusion, Fig. 1) before the complex fuses with the plasma membrane as a single unit . This means that the insulin content of multiple prefused granules could be released simultaneously, effecting more efficient release of insulin than the slower metered release of sequential granule fusion. Multivesicular exocytosis was thought to be a less pronounced mode of exocytosis in beta cells, in contrast to the situation in many secretory cells, such as mast cells , eosinophils  and neutrophils . In these secretory cells, a very large number of granules undergo rapid homotypic fusion to enable a massive release of granule cargo to effect the desired actions—allergic reactions , killing of invading parasites  and the acute inflammatory response , respectively. Neuroendocrine cells such as beta cells seem to require less of this mode of compound exocytosis and instead exhibit a slower metered and sustained release, primarily effected by increasing primary exocytosis and, when required, release is further increased by restricted sequential fusion of only a few granules of two or three [6, 7]. This metered release is also the mode by which polarised pancreatic acinar cells release digestive enzymes. However, in acinar cells, sequential exocytosis is much more extensive and is the primary mode used to increase secretion [13, 14, 15]. This is because the size of the acinar apical plasma membrane is extremely limited (5% of total plasma membrane surface) and so there is not enough space available for additional primary exocytosis during periods of increased demand [13, 14, 15]. In this issue of Diabetologia, Hoppa et al. report that, contrary to current thinking, multivesicular exocytosis could be upregulated in rat islet beta cells by the muscarinic agonist carbachol, acting primarily by evoking global elevation of cytosolic calcium and, to a lesser degree, protein kinase C (PKC). Compound exocytosis was observed to represent only ~5% of the insulin release events stimulated by 20 mmol/l glucose, but this was increased to 18% in the presence of the cholinergic agonist carbachol, enhancing GSIS by as much as 40%. Compound exocytosis was demonstrated by employing several complementary strategies. Two-photon imaging of SRB showed compound exocytotic events to be fivefold larger than single vesicles, and this observation was corroborated by three-dimensional (3-D) images constructed using confocal imaging (fixable FM1-43 dye) and electron microscopy. Fusion pores between these large numbers of homotypically fused granules remained open for tens of seconds, implying that there was sufficient time for multivesicular insulin cores to empty into the cell exterior. In addition, 3-D electron microscopy revealed that pretreatment with carbachol induced a threefold increase in homotypically fused granules, and occasionally up to six granules were observed to be prefused within the cell prior to fusion with the plasma membrane. Many of these multivesicular structures were located close to (within 1 μm) the plasma membrane in proximity to the primary source of fusogenic calcium arising from influx via plasma membrane calcium channels. Interestingly, Hoppa et al. did not observe a significant increase in primary exocytosis, shown in other reports to occur in response to GLP-1 potentiation [7, 8]. In addition, granule–granule fusion kinetics varied according to the stimulating compound used, with GLP-1-stimulated release largely the result of sequential fusion [7, 8] and carbachol-stimulated release largely produced by multivesicular fusion . This would suggest that downstream exocytotic fusion molecules acted upon by carbachol-evoked calcium (and PKC) signalling may be distinct from the exocytotic molecules coupled to GLP-1-evoked cAMP/PKA signalling. What are these exocytotic substrates that mediate the distinct exocytotic events, namely, primary exocytosis of docked and newcomer granules, and the granule–granule fusion that underlies sequential and multivesicular exocytosis? While much is known about the molecular machinery that mediates the primary exocytosis of docked insulin granules, namely, the neuronal soluble N-ethylmaleimide-sensitive factor attachment protein receptor (SNARE) proteins syntaxin 1A, synaptosomal-associated protein of 25 kDa (SNAP25) and vesicle-associated membrane protein 2 (VAMP2), and SNARE complex assembly-modulating proteins, including the PKC substrate syntaxin-binding protein 1 (STXBP1, also known as MUNC18-1) , very little is known about the molecular machinery that mediates the other exocytotic events. Interactions of another member of the STXBP family, STXBP3, with syntaxin 4 have been shown to influence second-phase GSIS, but the precise exocytotic event has not been elucidated . A recent paper on STXBP2 reported that overexpression of this member of the STXBP family in beta cells increased calcium sensitivity to evoke a larger exocytotic response , implicating that this protein modulates a distinct set of SNARE proteins. Much further work will be required to elucidate the identities and functions of these as yet undefined membrane fusion SNARE molecules, the accessory proteins that modulate the assembly and disassembly of these SNARE complexes and the precise exocytotic events shown in Fig. 1 that each set of these proteins mediates. The molecular machineries that mediate granule–granule fusion (sequential and multivesicular) and newcomer granule exocytosis are of importance for increasing insulin secretion in response to the increased demand in diabetes. These are required to compensate for the defective exocytosis of docked granules, which has been shown to account for reduced first-phase GSIS in type 2 diabetes [17, 20] and has been attributed to reduced beta cell levels of the neuronal SNARE complex proteins and STXBP1 . This is also important for type 1 diabetes since, at early stages of the disease, the reduced but viable beta cell mass still contains a sufficient number of beta cells to secrete insulin, but secretion needs to be more efficient. Sequential and multivesicular exocytosis would be preferred over primary exocytosis for more efficient release of insulin in both types of diabetes. Considering only a few per cent of total insulin content of each beta cell is released over several hours during a meal, there is potential for insulin release to be vastly increased. By employing this versatile spectrum of exocytotic modes to effect delivery of metered release of insulin to respond precisely and in tandem to physiological increases in glycaemic demand, this avoids insufficient or excessive insulin release, thus maintaining euglycaemia . Under normal conditions, it seems that the exocytotic machineries for granule–granule fusion and recruitment of newcomer granules were deliberately designed to be inherently inefficient in beta cells compared with those found in some secretory cells (mast cells, eosinophils, neutrophils) but more efficient than those present in other secretory cells (pancreatic acinar cells). However, this inherent exocytotic inefficiency renders beta cells unable to respond to excessive increases in glycaemic demand as diabetes worsens. This presents tremendous therapeutic implications and impetus for much more work to be done to elucidate these intrinsic, but undefined, exocytotic fusion machineries that could be coupled to cholinergic and incretin stimulation, thus enabling a more effective deployment of the more efficient exocytotic modes of compound exocytosis and recruitment of newcomer insulin granules to rescue the deficient glucose-dependent insulin secretion in diabetes . Supported by Canadian Institute for Health Research MOP 86544 and MOP 89889. The author was responsible for the design of the manuscript, writing the article and approved the version to be published. The author declares there is no duality of interest associated with this manuscript.